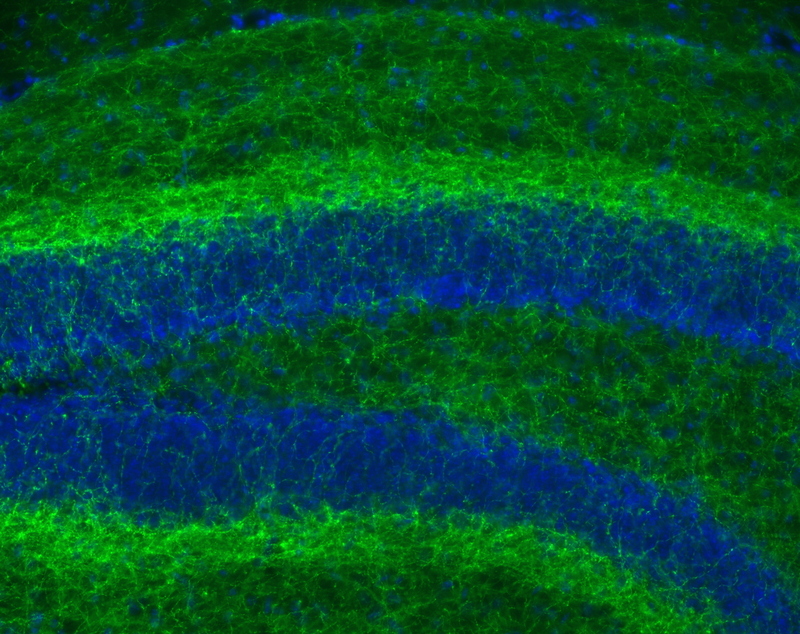 Caption: Cannabinoid receptor 1 (green) in the mouse brain. All cell nuclei appear blue. Relief of anxiety and stress is one of the most common reasons that people give for using marijuana . But the scientific evidence is rather sparse about whether there’s a biological explanation for that effect. More than a decade ago, researchers set out to explore the link between marijuana and anxiety reduction, but the results of their experiments were inconclusive . Recently, a team led by NIH-funded researchers at Vanderbilt University Medical Center in Nashville decided to tackle the question again, this time using more sensitive tools that have just become available in recent years. In humans, mice, and other mammals, the body makes natural chemicals, called endocannabinoids, that interact with certain proteins, called type 1 cannabinoid receptors (CB1), that are located on the surface of nerve cells. We know that the endocannabinoid system is critical for normal brain development and activity, immunity, and the physiological regulation of stress responses. We also know that CB1 receptors interact with the primary cannabinoid in marijuana, a mind-altering chemical known as delta-9-tetrahydrocannabinol (THC). To investigate whether there’s a biological basis for the anxiety-relieving effects associated with marijuana use, the Vanderbilt-led team decided to conduct a mouse study to search for CB1 receptors in the central amygdala—a region of the brain that, among other things, controls anxiety and response to stress. And, in a paper published in the journal Neuron, the researchers reported they did indeed detect CB1 receptors in the central amygdala of the mouse brain. In addition, the researchers found that when endocannabinoids interacted with CB1 receptors of neurons located in the central amygdala, the natural chemicals reduced the excitability of these brain cells. This suggests that THC and/or other external cannabinoids found in marijuana may also serve to reduce anxiety by binding to CB1 receptors in the amygdala, rendering neurons less active . However, this hypothesis must be confirmed by further studies. Last year, also in a mouse study, these same researchers showed that if they inhibited an enzyme called cyclooxygenase-2 (COX-2), which deactivates natural endocannabinoids, the levels of these chemicals remain higher in the brain and reduce anxious behaviors in the animals . These findings have prompted the researchers to investigate whether a new class of COX-2 inhibiting drugs might provide an alternative to marijuana-based cannabinoids for anxiety relief. Such alternatives may be especially valuable when it comes to protecting developing human brains from the adverse effects of marijuana. We all know that the teenage years can be filled with anxiety, and, perhaps in an effort to ease such anxiety, 6.5% of high school seniors report using marijuana regularly . However, frequent or heavy marijuana use among adolescents should be a cause of major concern. High doses of marijuana can have exactly the opposite effect, resulting in panic attacks and paranoia. Perhaps of greatest concern, scientific studies have shown that regular use in adolescents can be associated with addiction as well as altered brain development and permanently lowered IQ, not to mention a variety of other health problems [6, 7]. Cannabis for therapeutic purposes: patient characteristics, access, and reasons for use. Walsh Z, Callaway R, Belle-Isle L, Capler R, Kay R, Lucas P, Holtzman S. Int J Drug Policy. 2013 Nov;24(6):511-6. Distribution of CB1 cannabinoid receptors in the amygdala and their role in the control of GABAergic transmission. Katona I, Rancz EA, Acsady L, Ledent C, Mackie K, Hajos N, Freund TF. J Neurosci. 2001 Dec 1;21(23):9506-18. Multiple mechanistically distinct modes of endocannabinoid mobilization at central amygdala glutamatergic synapses. Ramikie TS, Nyilas R, Bluett RJ, Gamble-George JC, Hartley ND, Mackie K, Watanabe M, Katona I, Patel S. Neuron. 2014 Mar 5;81(5):1111-25. Substrate-selective COX-2 inhibition decreases anxiety via endocannabinoid activation. Hermanson DJ, Hartley ND, Gamble-George J, Brown N, Shonesy BC, Kingsley PJ, Colbran RJ, Reese J, Marnett LJ, Patel S. Nat Neurosci. 2013 Sep;16(9):1291-8. Adverse health effects of non-medical cannabis use. Hall W, Degenhardt L. Lancet. 2009 Oct 17;374(9698):1383-91. The association between earlier marijuana use and subsequent academic achievement and health problems: a longitudinal study. Brook JS, Stimmel MA, Zhang C, Brook DW. Am J Addict. 2008 Mar-Apr;17(2):155-60. I’m glad there is research being done on the cannabinoid system. I had a long discussion with my head oncologist yesterday about how stress activates the symptoms of my rare cancer (Carney-Stratakis) . . . I have found a liquid pill form of cannabis helps with many of my symptoms including sleep, anxiety and anorexia. My frustration with this article was the sentence that said, “We should look into more pharmaceutical COX II inhibitors.” Instead why can’t we set up some more studies which look at the benefits of cannabis in its pharmaceutical liquid form? It is a medicine that benefits many pathways that are involved in my form of cancer. Every new medicine that might work for my cancer is being marketed at about $80,000 a year. I feel the benefits of cannabis is both a logical road to start phase trials on which would have a cost savings to the government/health insurance companies over any new pharmaceutical. if this is happening to them as well? This blog represents the irresponsible use of a lofty platform to offer an opinion outside the field of expertise of the author. Dr. Collins has no in-depth training in neuroscience, neuropharmacology, mental illness or substance abuse. If he did, he might realize that even hinting that marijuana might be good for anxiety disorders is akin to suggesting that heroin might be effective. Yes, it works in the short term (and for marijuana, the term is really, really short), but as THC levels begin to drop, the rebound anxiety can be much worse than the original symptoms for many users. For example, Hasin et al., (2008) reported: “Cannabis withdrawal was prevalent and clinically significant among a representative sample of frequent cannabis users…….The symptoms formed two factors, one characterized by weakness, hypersomnia, and psychomotor retardation, and the second by anxiety, restlessness, depression, insomnia.”. Buckner et al., (2009) found “there may be long-term effects of marijuana use on high AS (anxiety sensitivity) female adolescents, such that high AS females who use marijuana are more likely to experience greater anxiety even when not intoxicated.” In a prospective study of adolescents. Hayatbakhsh et al.,(2007) determined that “The relationship between early-onset and frequent use of cannabis and symptoms of AD (anxiety and depression) is independent of individual and family backgrounds. Frequent cannabis use is associated with increased AD in young adults independently of whether the person also uses other illicit drugs.” Patton et al. (2002) found “Daily use in young women was associated with an over fivefold increase in the odds of reporting a state of depression and anxiety after adjustment for intercurrent use of other substances (odds ratio 5.6,95% confidence interval 2.6 to 12).” Medina et al (2007) in their study of polydrug users reported “extent of self-reported trait anxiety was predicted by increased marijuana use. “ Furthermore, as panic is indisputably the worse outcome of anxiety, and Zvolensky et al. (2010), found “lifetime marijuana use was significantly associated with increased odds of a lifetime panic attack history.” Zuardi et al. (1982) administered pure THC to normal subjects, and found that it increased anxiety, whereas cannabidiol counteracted that effect somewhat. Thus, cannabinoids other than THC may have a better profile for anxiety related effects, but Dr. Collins failed to make that distinction. At a time when the nation is embarking on an unprecedented experiment in allowing public opinion to dictate health policy at the state level, it would be prudent for our very top federal health officials to think very carefully before they speak out on this topic. Touting the results of experiments in rodents, in an effort to showcase the advancement of knowledge at the basic neuroscience level, should be phrased only in its proper context, i.e. how marijuana acts to ease anxiety only in the short term. The fact that it is already known that it offers no long term benefit, and in fact makes anxiety not better but worse, calls into question the premise upon which the researchers of the cited studies are operating. Their next series of experiments should be to develop an animal model that examines why THC makes anxiety worse in humans over the long term. I do not find this blog irresponsible at all, sorry Mrs Miller. The fact that this post has an alternate opinion about the effects of tetrahydrocannabinol (THC) on the brain is rather interesting.